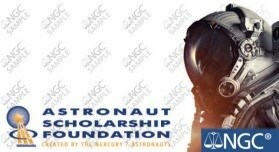 The special label will help the Astronaut Scholarship Foundation, which also benefits from the sale of the coins. 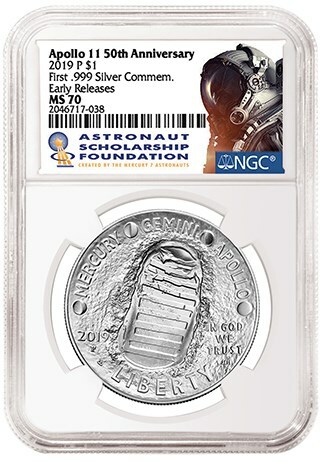 Numismatic Guaranty Corporation® (NGC®) has officially licensed the Astronaut Scholarship Foundation (ASF) logo for special NGC certification labels that celebrate the US Mint’s Apollo 11 50th Anniversary Commemorative coins. The coins go on sale at noon on January 24, 2019. The Apollo 11 50th Anniversary Commemorative coins are among the most highly anticipated US Mint issues of the last decade. The coins are particularly noteworthy for their curved design, which resembles the view of the moon’s surface from an astronaut’s helmet. Clad half dollars, silver dollars in one-ounce and five-ounce sizes and gold five dollar coins are being struck. Notably, both the one-ounce and five-ounce silver dollars are being struck in .999 fine silver instead of the usual .900 fineness. This is the first time that a US commemorative silver dollar has been struck in .999 fineness, and this composition will be reflected with a notation on the NGC certification label for the one-ounce dollars. Also significant is the curved silver five-ounce coin. The largest curved coin ever issued by the US Mint with a diameter of three inches, its production presented numerous challenges. These were ultimately overcome and the Apollo 11 silver five-ounce is expected to become one of the most desirable US modern coins in recent memory. In addition, a set is available with a one Apollo 11 Proof Half Dollar and one Enhanced Reverse Proof Kennedy Half Dollar. This is the first Enhanced Reverse Proof Half Dollar minted by the United States. To learn more, click here. The legislation that authorized the Apollo 11 coins designated the ASF as one of three organizations that would benefit from a surcharge applied to the sale of these coins. The additional beneficiaries are the Smithsonian Institution’s National Air and Space Museum and the Astronaut Memorial Foundation. ASF was created in 1984 by the six surviving Mercury program astronauts as well as the widow of the seventh. Each year, ASF provides more than 50 scholarships to outstanding college students in science, technology, engineering and mathematics. The six manned flights of the Mercury program enabled NASA to master the technology necessary to put astronauts in orbit. This critical step paved the way for the Gemini and Apollo programs that followed, culminating with the Apollo 11 moon landing in July 1969. That historic mission is celebrated by the coins being released this month. 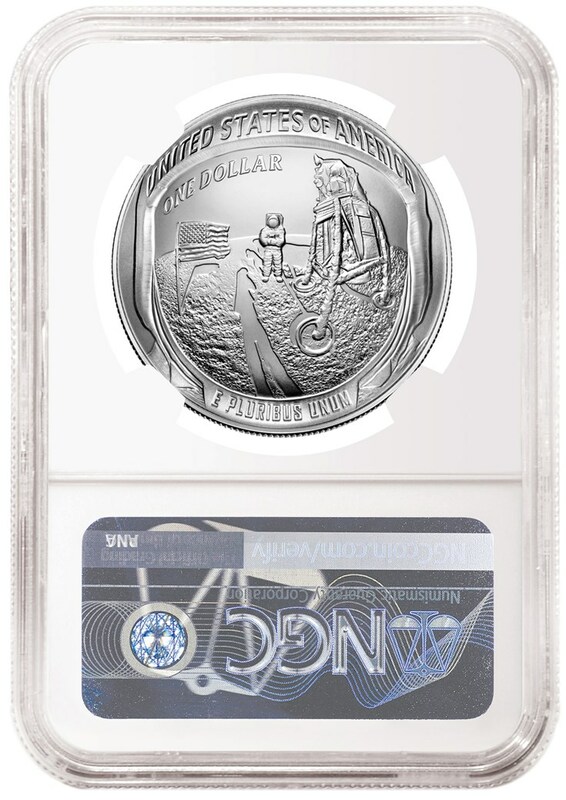 The NGC ASF label is the default label for Apollo 11 50th Anniversary Commemorative Coins submitted to NGC and carries an automatic $5 fee. A royalty will be paid to the ASF by NGC for each label used. Submit the Apollo 11 50th Anniversary coins under the Modern grading tier or higher. Select Double Thick Holder (+$5) for the one-ounce Silver Dollar and NGC Oversize Holder (+$20) for the five-ounce Silver Dollar. 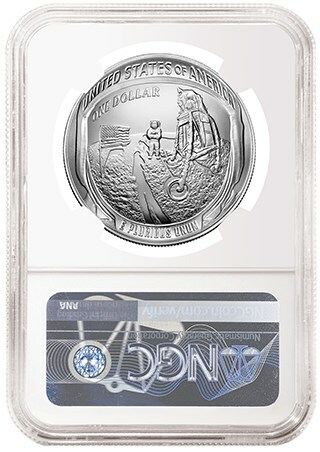 The default label (for a $5 fee) is NGC’s Apollo 11 Label #1128 or Label #1140 for the five-ounce silver (shown below). 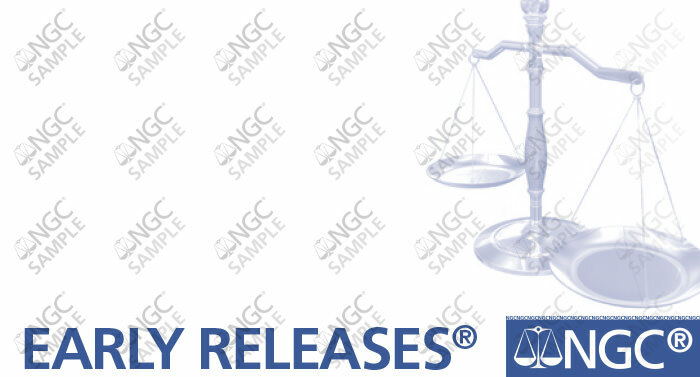 This label is also the default label for Early Releases and First Releases designations. 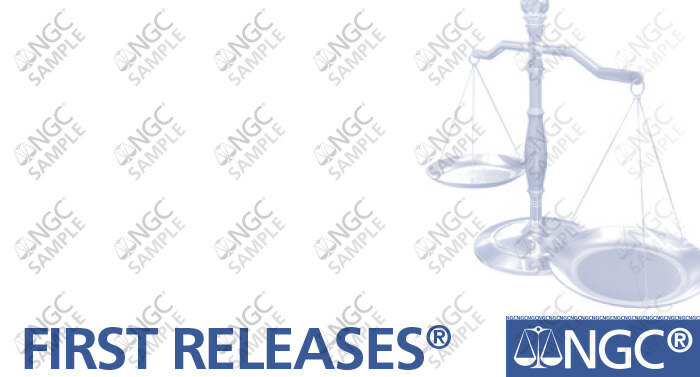 If the Early Releases or First Releases designation is desired (+$10), select Early Releases or First Releases on your submission form. Write Early Releases Label #378 or Blue First Releases Label #379 to get the accompanying label. Otherwise, Apollo 11 Label #1128 or #1140 will be used (+$5). 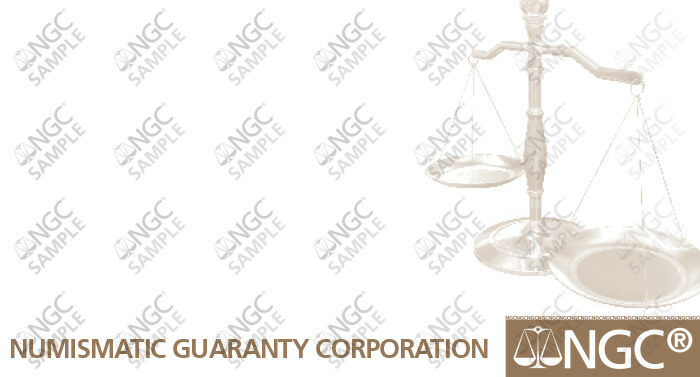 If you want NGC's Standard Brown Label (shown below), write Standard Brown Label #377.